“Far away, ends a summer day. And the breeze it carries your quiet sigh. Pretty bird, why do you hide your head and cry. Ooh, there is a love that stays now. Ooh, let it all fly away now. Ooh, lie awake and you’ll find love waiting. Down a path that never was an easy one. So rest your head, come lay it down. “A single word can be a powerful thing. It can be the ripple in the pond that changes everything.” – Ali Edwards. What WORD are you Inviting into 2015? In 2014, I picked a Word, not knowing that it would IMPACT my life in such a deep, profound and life-changing way. This is why I invited you to think about Your Word: What is YOUR WORD for 2015? 10 Days to Reflect, Realign, Rephrase, REWORD. Today, we are 10 days into the the New Year 2015. If you have not thought of a word, you can start Now. Listen in, and let that word show up for you. This could possibly be one of the most important thing YOU can do for YOU, in 2015. This is not just any other year. 2015 will not happen again. How would you like to show up for this year? How would you like this year to show up for you? What would you like to invite more of into your life this New Year? Listen in for that Big Word (Vision Word). And then the supporting actionable words (Mission Words) will start showing up for you. I only realised the far reaching effect of the Word as I stood at the last week of December 2014 and traced my way back to January. That’s when I saw how everything unfolded the way it did, and contributed to the experience of a WHOLEHEARTED year. That was my word last year. I did not anticipate that being WHOLE meant facing and admitting my dark side. I found myself in a lot of situations where I was continually given the opportunity to meet with what Jung would refer to as my “Unconscious Shadow”. Needless to say, it has not been easy. There were many painful situations and outcomes that I had to deal with and come to terms with. I had so many inner dragons I needed to face, and eventually befriended. Through it all, the effect has been WHOLESOME and I am grateful. This year, when the word GRACE caught my attention and got me so curious, I knew it was My Word for 2015. But I was a little scared. GRACE seems like a nothing word. It seems so vague (because my understanding of it is still a little vague). Even so, I went with it. And I am discovering what a HUGE word it really is. I am seeing and learning that all these meaningful words like Patience, Wholeness, Wholeheartedness, Kindness, Compassion and Love, are all parked under it. By allowing myself to learn, and grow into Grace, I will allow myself to grow into these other words. How about you? What would you like to learn, discover and experience more of in 2015? What do you want to GROW in you? My friends have been sharing their words with me. For one, it’s Conscious. For another, it’s BOLD. And yours is? “A single word can be a powerful thing. It can be the ripple in the pond that changes everything. It can be sharp and biting or rich and soft and slow. In 2006 I began a tradition of choosing one word for myself each January – a word to focus on, meditate on, and reflect upon as I go about my daily life. My words have included play, peace, vitality, nurture, story, light, up, open and thrive. These words have each become a part of my life in one way or another. They’ve been imbedded into who I am and into who I’m becoming. They’ve been what I’ve needed most (and didn’t know I needed). They’ve helped me to breathe deeper, to see clearer, to navigate challenges, and to grow. So what do you do with this one little word? You invite it into your life. You let it speak to you. All the best with finding Your Word, and I hope you’ll have an enriching journey of LIVING, Learning and GROWING with that word in 2015. We are SEVEN Days into the New Year 2015. A friend of mine shared that it feels as if there isn’t any difference, just another day as life continues. For some of us, we may feel this to be true, too. But for those of us who’s been dealt with difficult circumstances and painful losses at the start of the year, we may wish this is true. But for ALL of us, here’s what is true, as well: Whatever we may be going through, there is New Grace for each New Day. 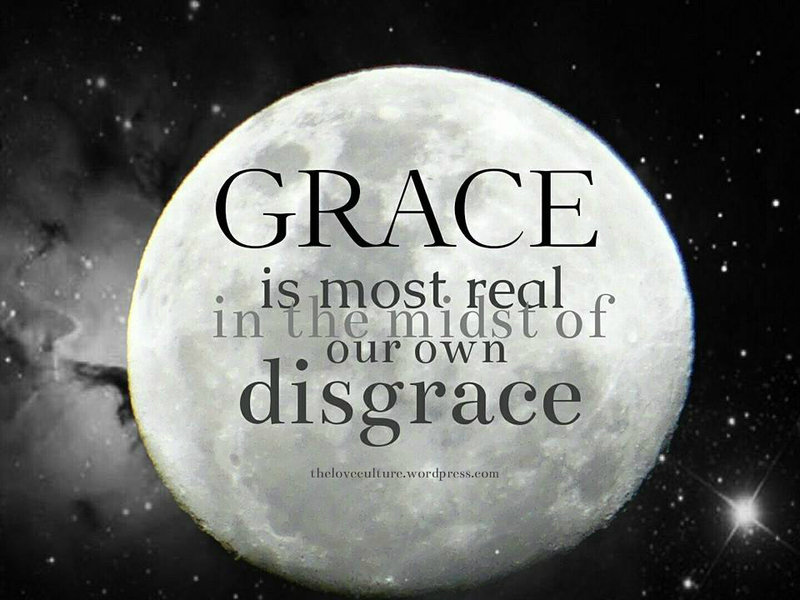 The question is, what is Grace? That’s my question coming into this New Year. I’ve decided to make it a personal journey of discovering for myself what GRACE means in each and every day, in all that happens, in everything that is unfolding, and in all that I do—in the heart of Life. So far, I am learning that Grace is a huge part of being Whole and Wholeheartedness. “To live by grace means to acknowledge my whole life story, the light side and the dark. In admitting my shadow side I learn who I am and what God’s grace means.” – Brennan Manning. Whatever life stories you may have been living, experiencing and carrying forth from the past into the present, may Grace awaken you to a New Wholesome Story—your WHOLE-STORY—not just the light side or the dark, but the gentle and gradual integration and acceptance of both. It is a process. It is a daily thing. It is to be lived. And one way to experience Grace, is to simply Begin Again. Being present in the Present.